But the cost per click dropped by roughly 7 percent on Google's sites. The cost dropped by 13 percent on outside sites. The drop could be due to the lower price of ads on mobile devices. Google is working hard on specialized software for mobile devices such as its Google Now digital assistant. Last month during the Google I/O developer conference, Google announced a number of new projects to get Google's Android mobile operating system on more devices, including watches and in-car displays. During a conference call on Thursday's results, Google admitted it has some problems monetizing its services on smaller screens, at least for now. "Right now, mobile does not monetize as well as certain other forms," said Nikesh Arora, Google's chief business officer. "But given the huge influx of queries we're seeing, we expect as it's made more relevant to find information, in the long term, mobile should monetize even better than the desktop," he said. Google still dominates the market for digital advertising, this year taking in more than 31 percent of all spending on digital advertising worldwide, according to the research group eMarketer. 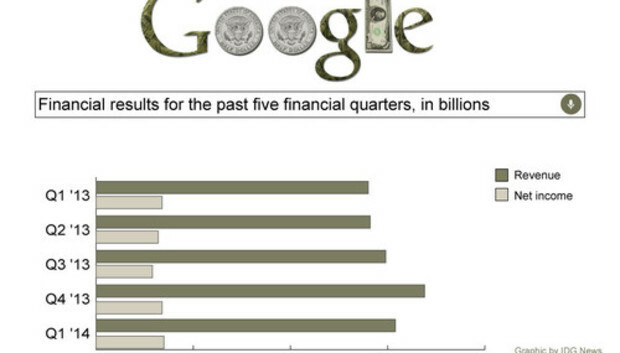 Google will lose about half a percentage point of market share this year, eMarketer predicted in a recent report. That will primarily be due to the growing success of its competitors, eMarketer said. Facebook is doing well in mobile, with nearly 60 percent of its sales made there, the company reported in its first-quarter earnings report in April. Google does not break out the percentage of its sales derived from mobile. Google also said Thursday that Arora would be leaving the company after 10 years with Google. He will be replaced for now by Omid Kordestani, Google's business founder, the company said.